The Tickford saloon has a smooth, modern form. A long sweep of the front wings eliminates any suspicion of slab-sidedness. Screw-on hub caps are fitted to the perforated-disc wheels. The Healey company is one of the very few organizations of its kind to be formed since the war for the purpose of building motor cars. This in itself is no mean achievement in times of restrictions and shortages, when any new venture is bound to be beset with difficulties, especially small company with relatively limited resources. Even more credit is due when it is realized that a whole range of models has been designed and produced, all of them in the high-performance class. Since the original Riley-engined model was produced several other makes of engines have been used to suit the particular requirements of the various models. Perhaps the best-known example is the Nash-engined Healey, which in its latest form is dressed by Pinin Farina. Truly an international car. It is, however, available only for export at the moment. 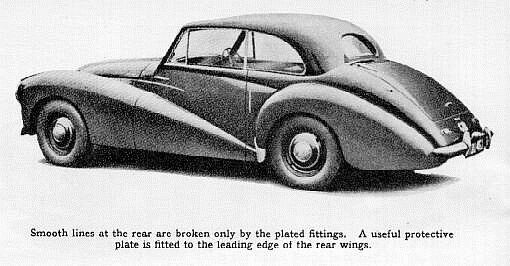 The home market is catered for by the 3-litre Alvis-engined two-seater and the Riley-engined model with either a convertible or a saloon body, and it is this last-named version that has recently been tested. A close-coupled four- seater coachbuilt saloon, built on a sports car chassis and powered by a well-designed twin high-camshaft and push rod 2.5 litre engine, to be a car with very desirable qualities. After driving it for over a thousand miles for test purposes, both in this country and in Belgium, where the performance figures were recorded, there is no doubt in the minds of those concerned that this car has a definite appeal. It its one for the specialist	driver who requires high-speed transport and at the same time closed-car convenience. 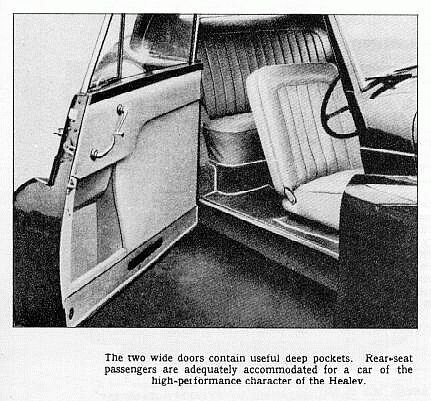 The passenger space is comfortable for two persons and quite a lot of luggage, yet four persons can be carried, although it must be admitted that the rear seats are somewhat cramped. However, for this type of car this disadvantage is offset by the fact that the reduction of interior space permits a car of low overall height, which, coupled with a body of low drag characteristics, results in a car that is very economical on petrol, even at high speed. 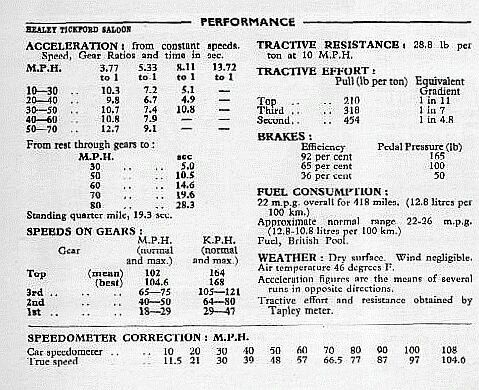 For example, even during performance testing the fuel consumption did not fall below 22 m.p.g. 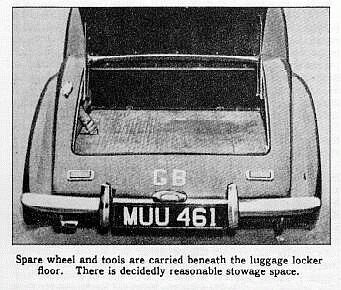 The Healey, too, is one of the few cars tested by The Autocar that has a mean maximum speed of over 100 mph. It is therefore not surprising that high average speeds are obtained without its giving the impression that it is being overworked, average speeds nearer fifty than forty miles to the hour being common. Although the big four-cylinder engine is quite flexible it shows a definite tendency to pink on Pool petrol if it is allowed to slog, or even at fairly high speeds when accelerating hard. However, with improved fuel obtainable abroad, pinking is eliminated. Intake noise or power roar is noticeable, but the degree of silence sacrificed is directly beneficial in the increase of power obtained. Also, wind noise is very low and above 60 m.p.h. the overall noise level is distinctly lower than average, conversation being quite easy even at 100 miles an hour. Normal main road hills can be climbed fast on top gear, while third will deal with most of the steeper variety; second gear is valuable for gradients steeper than 1 in 6. More important perhaps than the ability to travel at well over a hundred miles an hour is the safe feel of the car when it is doing so. The suspension, unusual in that it has trailing arms all round, provides a means of really glueing the car to the road. This, together with the low build of the body, results in a very stable vehicle. Directional stability is further improved by understeer characteristics. Slightly more castor action in the steering would be an advantage, but this can very easily be obtained as this is one of the few modem cars on which such an adjustment is provided for. The damper arms which form the top links of the suspension are fitted with eccentric bushes at the outer pivot point, and if these are turned the alteration in effective arm length varies the castor angle. Briefly, this is a car that stays on course at all times, and has that firm, positive feel on corners that inspires confidence. All this is achieved at the expense of a ride that is a little hard by present-day standards, but not unduly so. There is almost no roll on corners, and the riding is not too hard for comfort on rough surfaces. Retardation by means of Girling hydraulically operated brakes (with two leading shoes at the front) is very effective, although the pedal pressure required to obtain maximum efliciency is higher than usual. The brakes did not show any signs of fade during the severe conditions of performance testing, and they did not require any adjustment to restore balance or reduce pedal travel after a very substantial mileage had been covered. When sitting in the Healey the driver does not get the impression that the car is as low as it really is. This is because the seating arrangements do not place him in an uncomfortable position an inch or so from the floor, but reasonably high up in a position where control can be easily directed. 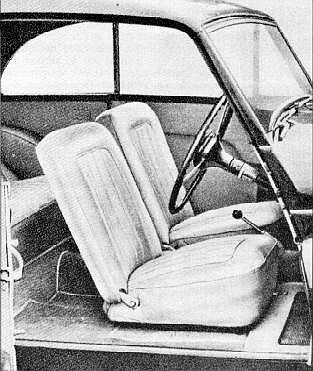 Both front seats are adjustable for leg length, and the angle of the seat backs can be varied by means of an adjusting screw for each, though these do not enable the back rests to be positioned as near to the vertical as is desired by some people. The steering wheel is well placed and mounted on an adjustable column; it has a pleasingly shaped rim and is comfortable to hold. The horn button and direction indicators control are mounted on the wheel hub. It would be an advantage if the spring under the horn button were a little stronger, as it apt to be operated inadvertently by the back of the driving seat when this is pivoted forward to gain access to the rear seats via the wide door. All the pedals are well placed and there is room for the driver's left foot between the tunnel and the clutch pedal, a very desirable feature. The clutch is smooth and the pedal pleasant to operate. 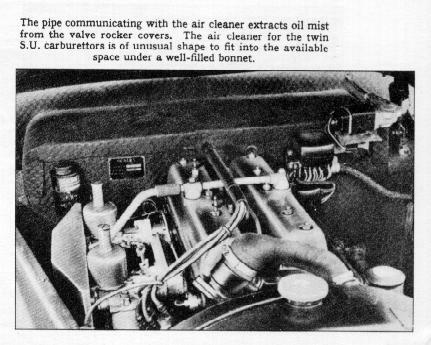 The organ-type throttle pedal, too, is arranged to give a nice action, and is correctly positioned to permit heel-and-toe gear changing if desired. The central remote-control gear change is very positive and does not vibrate. The lever is short and rigid and nicely positioned; because of its cranked shape the movement is more up and down than backwards and forwards, which tends to make its operation feel a little heavy, and also its shape causes it to get in the way, in reverse position, of the hand brake lever placed conveniently between the seats. Minor controls and switches are arranged in two groups, one in the centre of the facia and the other on the right-hand side below the radio controls if such equipment is fitted. To enable the best performance to be obtained with different types of fuel a hand-operated overriding ignition control is provided on the facia. Another very useful provision is a reserve petrol supply, brought into operation by a switch on the facia, which also illuminates a warning light showing that the reserve supply is being used. From the driving seat forward visibility is very good and both front wings can be clearly seen; the windscreen pillars are nicely shaped and slender, with the result that blind spots are reduced to a minimum. The rear view mirror is well placed, but better rear vision would be obtained if the rear window were larger. General finish, both of the inside and of the exterior, is much above average as, of course, must be recognized is the price also. In particular the hardwood facia is very well polished. Circular instruments are spaced across it, not closely grouped in front of the driver, but this arrangement does prevent windscreen reflections in front of the driver's eyes when the instrument lights are on. 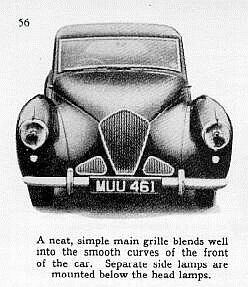 The head lights are quite definitely in keeping with the rest of the car; they are powerful and have a good range as well as a useful spread - the kind of lights, in fact, that make night driving a pleasure. The twin horns have a pleasing note, yet for a car of this type a more powerful warning system would be advantageous. Starting from cold was quick and little use of the choke was required. The Healey is a car with a very definite appeal to the driver who requires high-speed quality transport with an accent also on good petrol consumption, two very desirable qualities that do not usually go together. Also it has saloon car comforts and protection. Briefly, it looks and feels right.